The Staging Post, a film by Jolyon Hoff, 2017. Courtesy The Staging Post/Cisarua Learning. Jolyon Hoff, Khadim Dai and Muzafar Ali. Courtesy The Staging Post/Cisarua Learning. Muzafar Ali had worked for the United Nations in Afghanistan, where he learnt about human rights and declared that ‘having access to an education is a universal human right’. Khadim Dai had escaped Taliban persecution and was living as a refugee in Pakistan, when his school was bombed and 126 people were killed, including his best friend. Both Muzafar and Khadim fled to Indonesia where, faced with the prospect of many years living in limbo amongst the sizeable community of refugees and asylum seekers, they co-founded a school called the Cisarua Refugee Learning Centre. 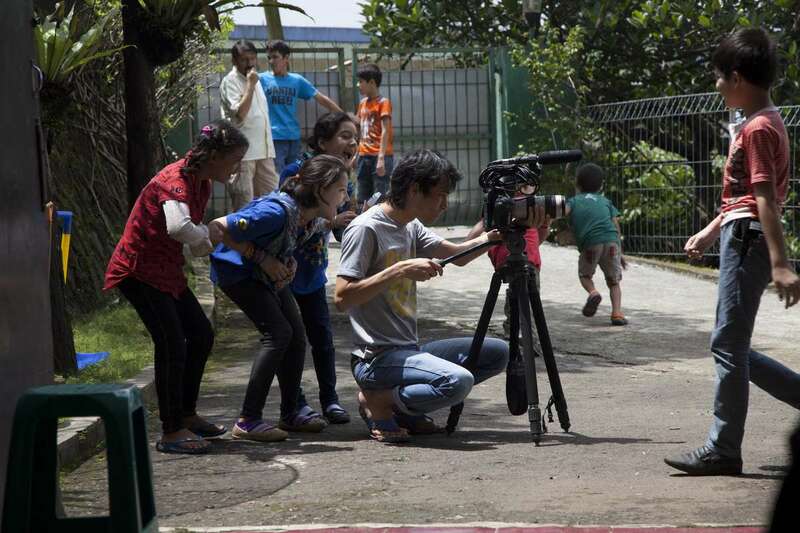 This modest beginning would inspire a refugee-led learning revolution in Indonesia, which now has 10 refugee-managed schools with some 100 volunteer teachers providing an education to more than 1,500 students. The Staging Post follows the story of Muzafar, Khadim and the community of Cisarua, with cinematography by Khadim. 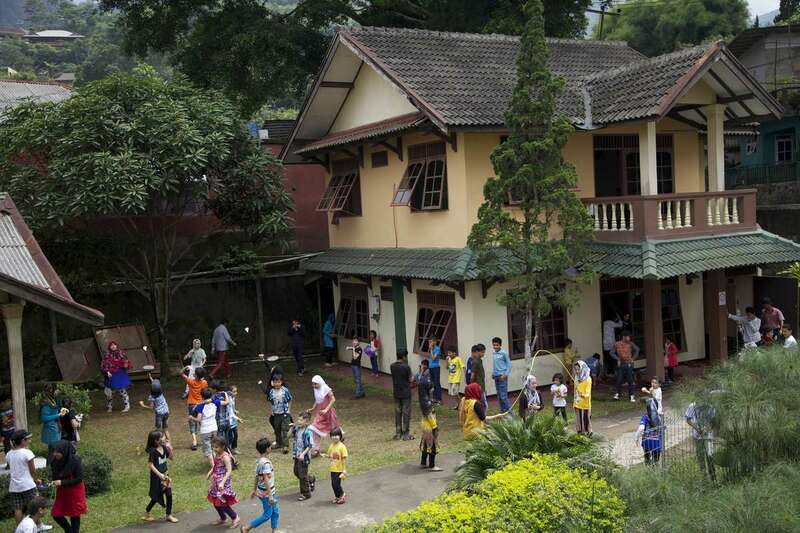 The Cisarua Refugee Learning Centre in Indonesia is managed entirely by volunteer refugee teachers. Courtesy The Staging Post/Cisarua Learning. The notion that refugees and education can be part of a larger solution is the key message that lies at the heart of Jolyon Hoff’s thought-provoking film. It’s a compelling story of community, agency, resilience and hope – one that validates the dignity of refugees and empowers people to contribute their own voices to the narrative. The Staging Post has been screened at more than 20 community events throughout Refugee Week, with an emphasis on bringing refugees and Australians together through facilitated Q&A conversations with the filmmaker and two film leads after each screening. The museum’s dialogue session last Thursday night featured Jolyon Hoff, Muzafar Ali, Khadim Dai and myself, and was moderated by Malini Raj, the head of strategy for multicultural community banking at the Commonwealth Bank. Muzafar Ali, Khadim Dai and Jolyon Hoff during early days of shooting on The Staging Post. Courtesy The Staging Post/Cisarua Learning. The session focused on how the arts can help to foster positive narratives about refugees and asylum seekers, and how this in turn advances understanding of refugee policy and resettlement in local and regional communities. The moderated discussion, as well as the questions that followed from the audience, highlighted the real impacts of immigration policy on people’s lives and showed that documentary filmmaking and museum programs have much in common, by inviting audiences to focus on personal, individual stories in order to humanise the facts of history. For me, as a curator with an interest in the intersection of material culture and memory, the most moving moment in The Staging Post was when Khadim spoke about his two most precious personal possessions. The first is a wool hat that was made by his mother, which he noted still had the smell of his mother, thus evoking the meanings embedded in tangible objects and the incredibly emotive power of sensory memory. Khadim Dai was waiting for someone to film him. Courtesy The Staging Post/Cisarua Learning. The second possession is a mobile phone on which Khadim recorded a video journal documenting his journey to Cisarua – from being smuggled from Pakistan to Thailand, to running through jungles in Malaysia and then clinging to an overcrowded raft to Indonesia. This mobile phone would prove to be a life-changing object; Jolyon later helped Khadim to edit his footage into an award-winning short film, and Khadim is now working in Hollywood after being resettled in the United States. 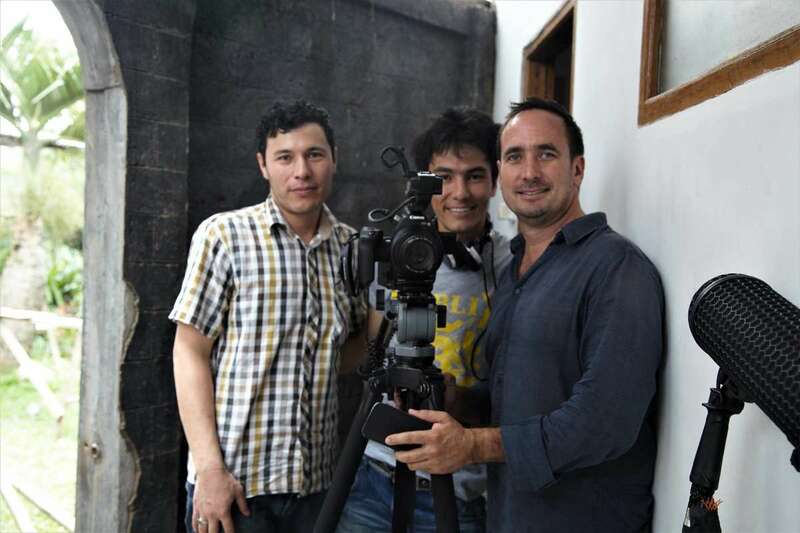 Meanwhile Muzafar, a passionate refugee advocate and renowned photographer, now lives in Adelaide with his family and is a student at the University of South Australia, while Jolyon is working on a follow up to The Staging Post. 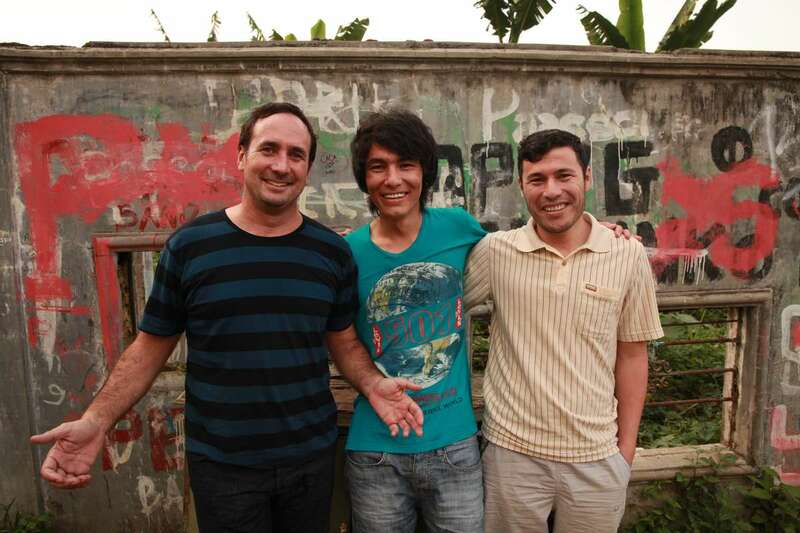 The three men continue to manage Cisarua Learning, an Australian registered charity that supports refugee education initiatives in Indonesia. 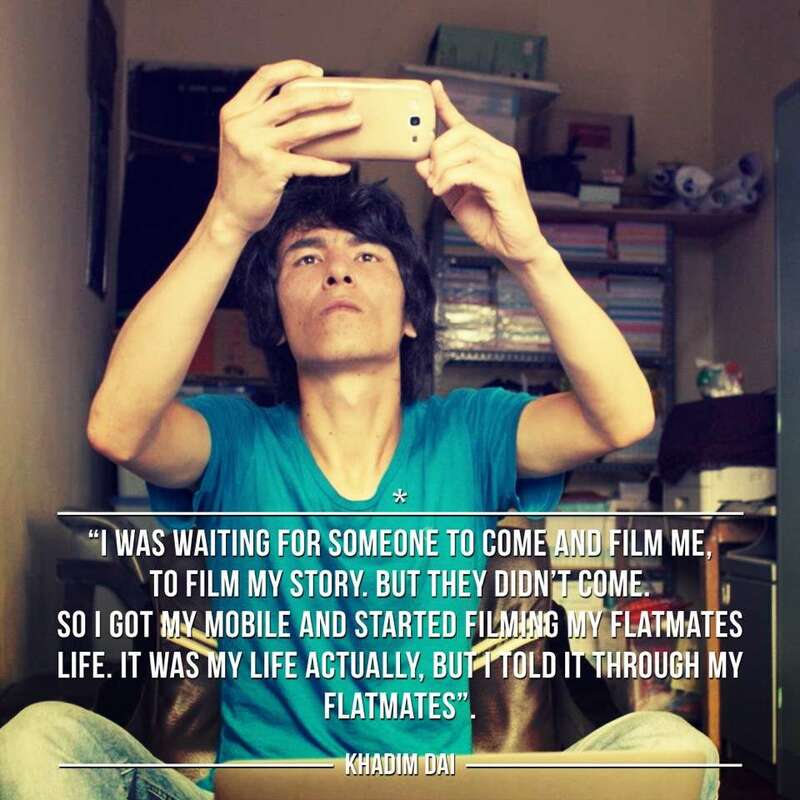 Khadim Dai was 17 years old when he started filming on his mobile phone. Courtesy The Staging Post/Cisarua Learning. Overall the Refugee Week event was a truly inspiring night, showcasing the capacity of film, filmmakers and storytellers to harness the communicative power of personal biography and remind us of our common humanity. You can view the trailer for The Staging Post, as well as a 15-minute excerpt of the film here. And if you have already seen the film, please let us know your thoughts in the comments below.